Bowel’s disease is an infection that is characterized by abnormal growth of cells on the epidermis layer of the skin. It was named after the specialist who first discovered it in 1912. Because this infection can progress into cancer, some professionals refer to it as pre-cancer. Others consider Bowen’s disease to be a type of carcinoma in situ. Based on statistics, 3 in every 100 patches of the infection develop into full blown skin cancer, also known as squamous cell carcinoma. The patches are normally crusty and rough and may start bleeding if scraped. As the patches grow, they may start to hurt or itch. They may as well advance into chronic sores on the skin or scars. In most cases, the infection affects the part of the skin that is exposed to sunlight, such as the lower legs, head and hands. Although the real cause for this infection is yet to be found, one thing is for sure, it is not inherited and not caused by allergic reactions. There are various risk factors that can predispose one to this infection. In rare occasions, this condition also affects the genital organs. This occurrence can be linked to the various types of human papilloma virus (HPV). Some types of this virus have also been associated with cancers, including cervical cancer. How Is Bowen's Disease Treated? Normally, the infection grows at a very slow pace for months or even years. 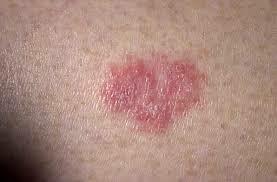 Therefore, if you happen to have a small patch of infected skin, you should watch it carefully. Additionally, it is also advisable to go for regular check-ups to monitor the patch. Regular check-ups are particularly beneficial for patients whose skin has healing problems. Also referred to as cryosurgery, cryotherapy is a freezing technique that is used to treat the infection. While using the method, liquid nitrogen is sprayed on the infected region. Initially, this may feel cold and uncomfortable. A scrap will then form on the infected region and then the infected skin will peel off within a few weeks. This remedy involves the use of anti-cancer drugs to treat Bowen's disease. In this case, a chemical known as 5-fluorouracil or 5FU may be used. Alternatively, Imiquimod cream may be used. The chemical is applied on the infected skin regularly within a period of time. The 5FU may make the skin red and inflamed before the condition is healed. The Imiquimo cream, on the other hand, makes use of the immune system to get rid of the infected skin cells. The cream may cause some redness and irritation on the skin before full recovery is achieved. This method involves scrapping of the infected region of the skin, also known as curettage, and making use of either electricity or heat to stop bleeding, referred to as electrocautery. This remedy is best suited for small patches of infection. Doctor will first administer an aesthesia before using a curette to scour away the infected skin cells and then use a needle or a loop that is electrically heated to stop the bleeding as well as damage the remaining abnormal cells. This remedy may leave a scar on the skin surface. This remedy may be used to treat an array of conditions, including Bowen's disease. It is particularly beneficial for the patients with large infectious patches. It involves the use of light, coupled with a light sensitive drug, commonly referred to as a photosensitizing agent, to get rid of the infected cells. While using the method, the photosensitizing cream is applied on the infected region and allowed to remain there for 3 to 4 hours. After this a special light is directed on the region for 10 to 15 minutes. A dressing is then applied on the patch to bar it from light. The method may require several treatments for full recovery. For small patches of Bowen's disease, a surgical procedure may be helpful. The surgery is carried out under a local anesthetic and stitches may be needed. However, this remedy may be not suitable for large patches. In this treatment option, intense light is used to get rid of the infected skin. Sometimes, it is used for Bowen's disease, when it occurs on the genital organs or on the fingers. Currently, researchers are trying to find out the long-term effectiveness of this method in treating Bowen's disease. After treatment, you will need regular check-ups with your doctor to monitorwhether there are any signs that may need further treatment. Additionally, you should also see your doctor if you notice development of a new patch adjacent to the treated patch or any changes on the treated patch. If you are not seeing your doctor regularly, it is advisable to keep a keen watch on the skin for any new developments. If you ever suffered from Bowen's disease, you need to take precaution to reduce sun exposure because you are at a greater risk of getting another patch. This may be done by wearing protective clothing as well as using sun blocks that have a protection factor of not less than 30. The ladies should wear long skirts, thick tights and trousers to protect the legs.